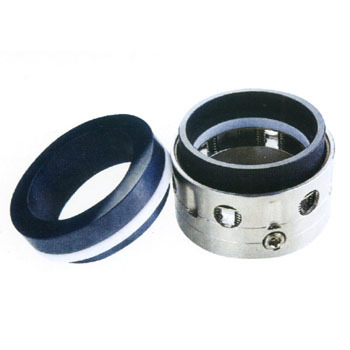 Mechanical seals often need to be used in chemical applications. When confronted with some harsh chemicals, mechanical seals containing elastomers made of Viton, Kalrez or Chemrez can't hold up. Because PTFE (polytetrafluoroethylene)or as most people know it Teflon ® , has a 0-14 ph range it usually will hold up. Can the Mechanical Seal be rebuilt? Like most materials every choice has an up and a down side. Because PTFE will handle most chemical applications, chemical attack is no longer an issue. One the down side PTFE wedges can cause fretting of your sleeve or shaft if you have not hard surfaced your shaft or sleeve (plasma coating). The stationary element of your seal will require a PTFE gasket. It's not much good to have a PTFE on the rotary and then use an elastomer on the seat. We have seen it done, and because it is a static application some have gotten away with it, but it is not recommended. Most commonly the seat will be a L-shaped or Clamped mount style to allow space for a PTFE gasket to be used as the secondary sealing element..
Let us know how we can serve you better, what you would like to see, or how you feel we can improve our site. Your input is appreciated. © 2018 Mechanicalseals.net. All Rights Reserved.